1. Preheat oven to 400°. In large skillet, cook beef, garlic and oil over medium heat 6 to 8 minutes or until meat is no longer pink, breaking up meat with side of spoon. Stir in chili powder and coriander. Stir in refried beans, salsa and jalapeños. Reduce heat to medium-low; simmer 5 to 7 minutes or until mixture thickens slightly. Remove skillet from heat; stir in salt. 2. 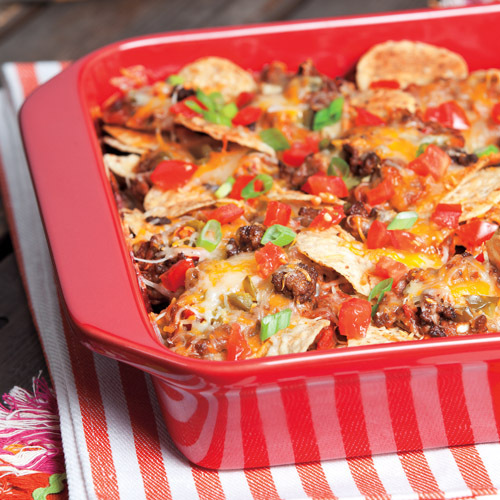 In bottom of 13 x 9-inch glass or ceramic baking dish, layer half the tortilla chips, then top with half the beef mixture. Repeat layers of chips and beef mixture. Evenly sprinkle cheese over top. Bake 6 to 8 minutes or until cheese melts and begins to brown. Evenly sprinkle with tomatoes. Top with green onions and serve with guacamole and sour cream, if desired.